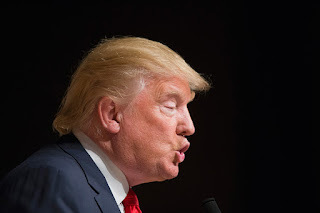 US republican party presidential candidate Donald trump has been the tartge of many rumors and accusations since he announced that he will be running for the office of the president. 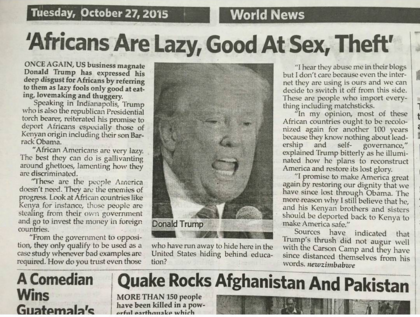 The recent rumors that have been doing rounds online and even on some print newspaper are that Donald trump mentioned in his speech that 'Africans are lazy and prone to crime' but it appears that it is just another claim without any basis. According to the rumors published don different websites, Trump made racist remarks during an October 25 speaking event in Indiana. Trump had a speaking event on the same day but it was not in Indiana, he appeared on Face the Nation on that 25th of October but there is no other evidence that he went to the other rally. No major news outlet covered any story on Donald Trump-speaking at an event in Indiana on October 25, which indicates that the statements were more than likely fabricated but it seems that many media houses fell for it. Trump has not yet commented on the same.